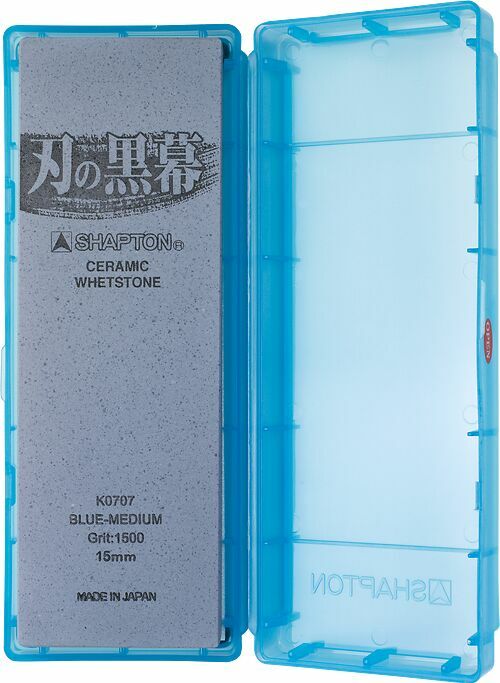 Great ceramic whetstones from Shapton for kitchen knives, chisels, planes etc. The Professional range has long been admired for its efficient cutting, and is a firm favorite among woodworkers. Somewhere around #1000 and #2000 is the perfect grade for regular kitchen knife sharpening - in fact, a well known chef's school in Tokyo gives one of these to each student as a leaving present. Plastic case doubles as a holding base, but you can just use a towel. Splash with water before use, store dry. Don't drop.